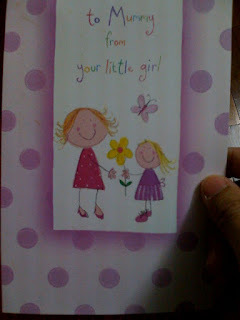 Bahija requested I take a picture of the Mother Day's card that little sen (daughter of Ringgit) sent to her mother on Mother's Day. See the pinkish card above. How can little sen (penny) can draw a picture now? You don't mengada ngada! We are not 3 years old!